Outside experts Starbucks engaged to help it transform itself after a racially charged incident offered some three dozen recommendations in a new report, including a top-to-bottom civil rights audit, a "customer bill of rights" and more resources for employees encountering customers experiencing homelessness, addiction or mental health problems. A lot has happened at Starbucks since it closed all of its U.S. stores for the afternoon of May 29 to conduct unprecedented anti-racial bias training – including the departure of Howard Schultz, who championed it. Now, a new report from two top outside advisers on the company’s response to the arrest of two black men in a Philadelphia store in April lays out what more Starbucks should do to make a durable change to its practices and culture, which company executives say they intend to do. “For Starbucks, this effort to confront bias is not separate from running our business, it will be the way we run the business,” company spokesperson Alisha Damodaran said in an email. The recommendations include a top-to-bottom civil rights audit, more resources for employees encountering customers with mental-health and addiction problems, and the creation of a “customer bill of rights” to be posted at each store. Starbucks is already undertaking several ongoing initiatives, some of which hew closely to those in the report. "Toward a Vision for Racial Equity & Inclusion at Starbucks: Review and Recommendations"
The report was written by Heather McGhee, a distinguished senior fellow at the equality focused research and advocacy organization Demos, and Sherrilyn Ifill, president and director-council of the NAACP Legal Defense and Education Fund. They were two of the first people that Schultz, then executive chairman, contacted after the arrests. Starbucks reviewed the report before it was released. McGhee and Ifill write that Starbucks told them the May 29 training was successful in some respects, based on internal surveys taken before and after. Starbucks had faced some criticism that it was not adequately measuring the outcome of such a large-scale training effort, which included some 175,000 employees. Company surveys found “a significant increase” in employee understanding of unconscious bias, “as well as the belief that the company was living up to its values,” McGhee and Ifill write. Starbucks says about 9,000 baristas, shift supervisors and store managers responded to the surveys. McGhee and Ifill note that Starbucks did not heed their recommendation that the training happen in regional centers where large groups of employees could gather under the guidance of skilled facilitators. They note a report by public radio’s “This American Life” from inside one of the training sessions that indicated the conversation often departed from race. “This is a typical avoidance measure that a trained facilitator would have been able to turn into a teachable moment,” they write. The company opted for a self-guided curriculum that small groups followed in each store, complemented by video messages from company executives and outside experts. According to the report, the short timeline for the training made it difficult to find and coordinate enough trainers. Instead, Starbucks bought 23,000 iPads, loaded the training curriculum, and shipped them to stores. 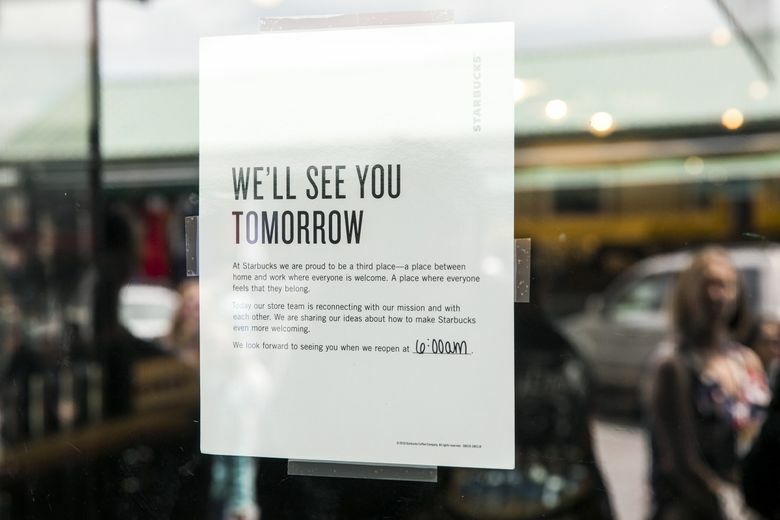 Starbucks said the next monthly training, which will not involve store closures, will cover “Mindful Decision Making,” including the impact of discrimination. Next year, Starbucks plans to hold a conference for upwards of 15,000 store managers on the topics of bias and inclusivity. McGhee and Ifill call for independent experts to audit the company through a civil-rights lens, looking at things like variances in customer treatment based on background and racial equity in the Starbucks work force, from front-line employees to the boardroom. They credit the contributions to Starbucks’ response from two black women: director Mellody Hobson, now vice chair of the board in the wake of Schultz’ departure, and chief operating officer Rosalind Brewer, who Starbucks hired from the Walmart empire last September. They also note an internal memo from chief executive Kevin Johnson in which he calls for increased diversity in the corporate headquarters. The report suggests the company’s policy manuals should be overhauled to prioritize equity throughout the company culture; clearly direct employees on managing customer relations, including how to respond to incidents of discrimination, bias and harassment; and a “customer bill of rights” to be posted at each store, clarifying new policies including the opening of restrooms and stores to all customers, whether they’ve made a purchase or not. That policy change may increase the interactions of Starbucks’ front-line employees with customers experiencing homelessness, addiction or mental health problems. As part of the change, Starbucks has partnered with United Way to give employees options, including the national 211 phone number, for connecting those customers with resources rather than calling police. “This police alternative is essential,” McGhee and Ifill wrote. That national option should be augmented with local resources and programs, they added. McGhee and Ifill suggest local engagement should be a centerpiece of any further efforts to spark a broader conversation on race in America, such as the company’s 2015 Race Together campaign, “in lieu of crafting the effort at corporate headquarters.” McGhee and Ifill write. Damodaran said Starbucks is working with the Leadership Conference on Civil and Human Rights to help convene businesses and civil rights experts and advocates. Donte Robinson and Rashon Nelson, the two men who were arrested 10 minutes after entering the Philadelphia store on April 12, called for Starbucks to implement the report’s recommendations. The report was released Monday in the midst of a tumultuous period at Starbucks. Schultz, who helped lead the company’s response to the Philadelphia incident, stepped down from the board of directors effective last week, on his way to retiring from the coffee chain he built into a global behemoth. The Seattle company also recently revised its financial forecasts to reflect slower-than-expected sales growth, some of which was attributed to the training. Then Starbucks announced that chief financial officer Scott Maw is leaving later this year, sending the company’s stock to its lowest point in three years.